Many challengers are putting technology at the forefront of their efforts, employing new infrastructure and focusing on digital and mobile to attract and engage users, simplifying the overall experience. Compliance with AML and KYC regulations has created an industry mindset in the UK that this is a barrier to offering a 100% digital experience, with most banks offering a sign-up process that stalls at the point of proving a customer’s identity. 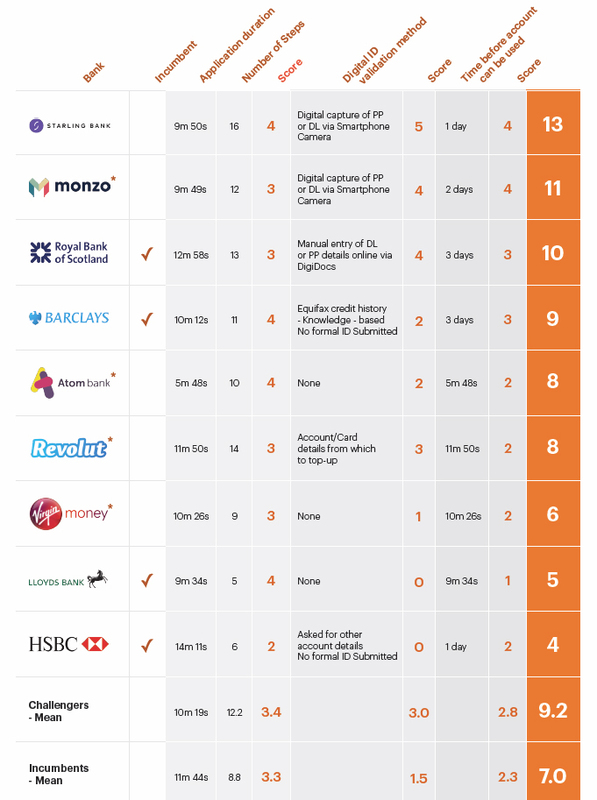 Aimed at providing a realistic assessment of the digital bank account opening landscape in the UK, P.A.ID surveyed UK high street banks covering 75% of the market as well as leading UK challenger banks. The result of this survey and scores and ranks these banks, based upon the live tests and evaluation conducted of the account opening and on-boarding process of each. Challenger banks were found to have made more progress than incumbents in introducing technology to improve the user experience and this extends to implementing digital identity capture and verification solutions that form part of a seamless customer acquisition process. This is important to address, as it is one of the traditional barriers that cause many customers to abandon their attempt to sign-up to a new account and will improve overall brand image as a modern service provider. This study’s underlying hypothesis is that the advancement in the analysed banks’ digitalization of their current accounts and savings accounts could be used as a barometer of each institution’s progress towards a full digital transformation. The results clearly show that challenger banks are stealing a march on their traditional competitors across all metrics. Being unburdened by legacy technology and infrastructure is a distinct advantage but more so is the desire to be truly digital, and arguably the understanding of what potential customers are looking for. Central to being 100% digital is the ability to verify customers’ identity online to the satisfaction of KYC and AML regulations. In the cases of Starling Bank and Monzo, (and to a lesser extent, RBS) this has resulted in a fast, secure and simple on-boarding process that the rest of the market may do well to emulate.